WASHINGTON -- Three Democrats walked out of a House Oversight and Government Reform hearing on religious liberty and the birth control rule on Thursday to protest Chairman Darrell Issa's (R-Calif.) refusal to allow a progressive woman to testify in favor of the Obama administration's contraception rule. 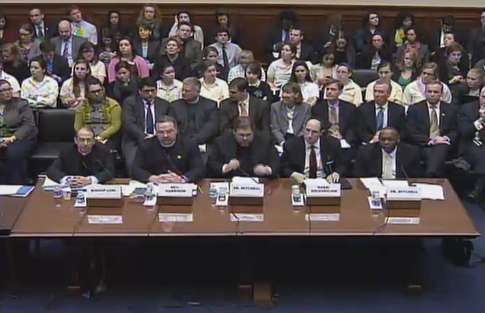 The morning panel at the hearing consisted exclusively of men from conservative religious organizations. "What I want to know is, where are the women?" Rep. Carolyn Maloney (D-N.Y.) asked Issa before walking out of the hearing after the first panel. "I look at this panel, and I don't see one single individual representing the tens of millions of women across the country who want and need insurance coverage for basic preventative health care services, including family planning. Where are the women?" Delegate Eleanor Holmes Norton (D-D.C.), told reporters in the hallway outside the hearing that she marched out because it was being conducted like an "autocratic regime." The other members who left were Maloney and Rep. Mike Quigley (D-Ill.). There are 10 witnesses testifying at Thursday's hearing. None of those individuals -- listed as testifying prior to hearing -- is in favor of the Obama administration's birth control rule, and few are women. Democrats say they tried to invite another witness -- a young woman -- to testify, but were blocked by Republicans. Issa said at the hearing that he rejected the Democrats' female witness, Sandra Fluke, because, as a Georgetown University law student who "appears to have become energized over this issue," she was "not appropriate or qualified." He said that in lieu of allowing her to speak at the hearing, he instructed his staff to post a video online of Fluke speaking at a previous press conference. Ranking Member Elijah Cummings (D-Md.) complained about the matter in a letter to Issa on Wednesday. "When my staff inquired about requesting minority witnesses for this hearing, we were informed that you would allow only one," Cummings wrote. "Based on your decision, we requested as our minority witness a third-year Georgetown University Law Center student named Sandra Fluke. I believed it was critical to have at least one woman at the witness table who could discuss the repercussions that denying coverage for contraceptives has on women across this country." In his letter, Cummings wrote that Issa's staff told Democrats that the chair had decided, “As the hearing is not about reproductive rights and contraception but instead about the Administration's actions as they relate to freedom of religion and conscience, he believes that Ms. Fluke is not an appropriate witness." Fluke has been a vocal supporter of the Obama administration's decision not to exempt religiously-affiliated employers from having to offer contraception, without a co-pay, to their employees under their health insurance. The White House recently rolled out a compromise, where insurance companies would have to pick up the cost of the contraception if an organization determined the requirement violated its religious sensibilities. After walking out of the hearing Thursday, Holmes Norton pulled Fluke into the hallway to allow her to speak to reporters. Fluke began to cry as she told the story of her 32-year-old friend who was diagnosed with ovarian cysts and prescribed birth control pills as the only remedy for her condition that could save her from becoming infertile. Because her student insurance did not cover contraception, Fluke's friend could not afford her medication, and she eventually lost her ovary and began experiencing symptoms of early menopause. "Those are the consequences of this policy, and those are the voices the chairman silenced today," Fluke said. Cummings stated in his Wednesday letter that Issa had violated Committee rules in regards to the witnesses at the hearing. "Instead of inviting Ms. Fluke to testify, your staff informed us that you planned to invite a different witness who was no longer available [Lynn] after being informed of your decision to limit the minority to a single witness," Cummings added. "Compounding this insult, this afternoon you added two more witnesses of your own, in violation of Committee rules requiring three days notice for witnesses called by the majority." Becca Watkins, Issa's press secretary, disputed Cummings' charges in a statement to The Huffington Post on Wednesday evening. "After days of asking the minority for a witness suggestion, at 1:04 pm today the minority requested that two witnesses be invited," she wrote in an email. "Only three hours later, at 4:18 pm the majority staff informed the minority staff that the Chairman was extending an invite to one of the witnesses the minority had requested -- it has long been a common practice at the committee for the minority to recommend a single witness. After the Chairman agreed to issue an invitation, the minority then objected saying the witness they had requested just three hours earlier was no longer their request." "As part of his efforts to obstruct the committee's oversight, Mr. Cummings continues to press the idea that he is entitled to special treatment that Democrats did not afford to Republicans when they were in the majority," she added. "Mr. Cummings' whining is a distortion of the reality that the majority quickly approved and issued an invitation to a witness selected by the minority." The issue of witnesses at committee hearings has been a sore subject between Issa and Cummings for some time. For instance, all administration officials who testify before the committee are considered minority witnesses, even if the Democratic members didn't invite them and don't agree with their position. Issa and Democrats have also argued over when staff members are allowed to accompany members on trips.